AMTECH offers straight-through configuration handling viscous fluids, thick slurries, and fluids containing solids. 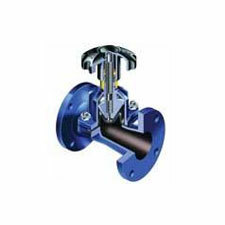 KB/ straight through diaphragm valve has flow facilitates line clearing. The spindle has long movements and so diaphragm life will be small compare to weir A type , so it will increase the maintenance of diaphragm. It require flexible diaphragm hence diaphragm material choice is limited to elastomers and very important. These valves are lined or unlined.